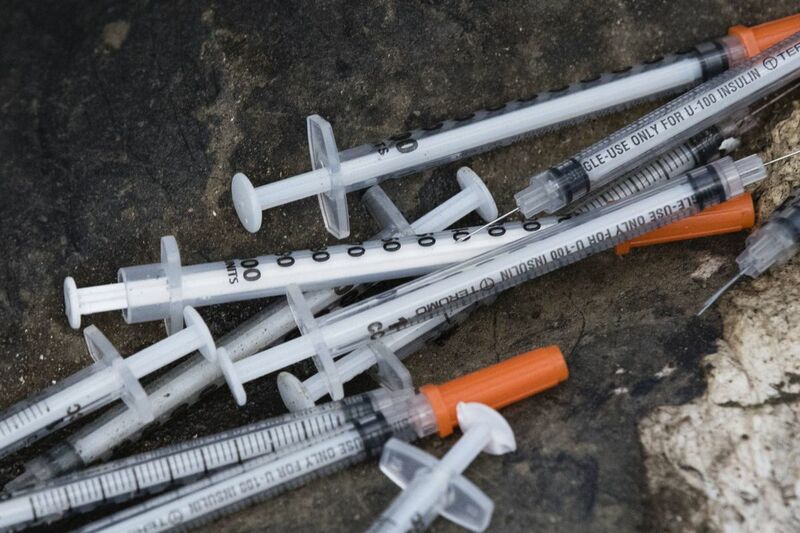 This July 31, 2017, file photo shows discarded syringes in an open-air heroin market that has thrived for decades, slated for cleanup along train tracks a few miles outside the heart of Philadelphia. Philadelphia wants to become the first U.S. city to allow supervised drug injection sites as a way to combat the opioid epidemic, city officials announced Tuesday, Jan. 23, 2018, saying they would seek outside operators to establish one or more safe injection sites. Safe injection sites where addicts can shoot up in a supervised setting could be a hard concept for many to grasp as anything but an invitation for users to inject poison into themselves with the city's blessing. To believe that, though, would be a mistake. Philadelphia announced Tuesday it would support the idea of sites that will not only provide medical supervision to addicts but give them access to treatment and other services. Such a move won't solve the deadly opioid crisis, but is intended to be damage control –literally. Such sites may control the fatal damage that drugs are inflicting, in a crisis that has laid waste to thousands of lives and families. Supervised sites – what the city is calling Comprehensive User Engagement Sites (CUES) — are just part of the city's response. They can reduce the number of people shooting up in public spaces and leaving needles behind. The sites can save lives. On that basis, they are worth adding to the city's arsenal of weapons against the killer epidemic. It's fitting that Philadelphia will be the first U.S. city to allow such sites, since the 1,200 who died here last year of a drug overdose is the largest number per capita of any American city. But it's a controversial response, and the city on Tuesday made a point of insisting that nonprofits and professionals will be operating them, and that no city money will be going directly to the sites. There's a case to be made for the city to reconsider that direct support. After all, the cost the city bears now is staggering, not only in human lives but in city services. Police, firefighters and others are armed with the lifesaving antidote naloxone, and they're using it to save hundreds of lives. When there aren't enough ambulances to take dying addicts to the nearest hospital emergency room, the city dispatches Fire Department vehicles. The city has been acting on many fronts to combat this scourge. It's talking to doctors to get them to stop casually prescribing opioids for minor pain and to insurance companies to get them to stop reimbursing for excessive painkiller prescriptions. It has cleared addicts from a drug encampment on the Conrail tracks in Kensington, an abandoned church, and the Kensington library lawn. It's suing five drug manufacturers to get them to stop aggressively marketing painkillers that lead users to street drugs. It's opened more treatment slots. In May, a mayoral task force recommended serious consideration of safe-injection sites. They won't end the opioid crisis. But they could lessen the grief for families who are losing a loved one to addiction.